Hello. I am Kittygrandma from Regina, Saskatchewan, Canada. I find most of the the photos here to be very beautiful and moving. My family thinks that I am crazy, but I don't care. Hello and welcome! I'm just like you, I find the pictures very sad yet beautiful. There was a poem that went with one of the pictures, which I sadly can't find anymore, which stated "there is beauty in death"... I totally agree. Hope you'll have fun browsing this site! It really is wonderful and the other members are very nice. Welcome to the community, kittygrandma! I'm Otis, from Monterey, California. Welcome according to my family they think im am crazy too when it comes to this subject so i believe you are in the right place a very warm welcome Kittygrandma!!!!! Thanks for all the welcomes. Glad to be on board with other like-minded people. I feel that by looking at these photos and thinking about the people - especially the children - who passed on so many years ago, we are keeping their memories alive. Everyone who ever knew them are long gone and most of these precious little ones are not even a footnote in their families' histories. But...here they are. And we remember, and we care. Welcome, welcome! I love the way you put your interest in PM photography into words just then. Exactly how I feel. I am Nuria from Barcelona,Spain.I like also this website with this photos! wow thanks dave!!!! 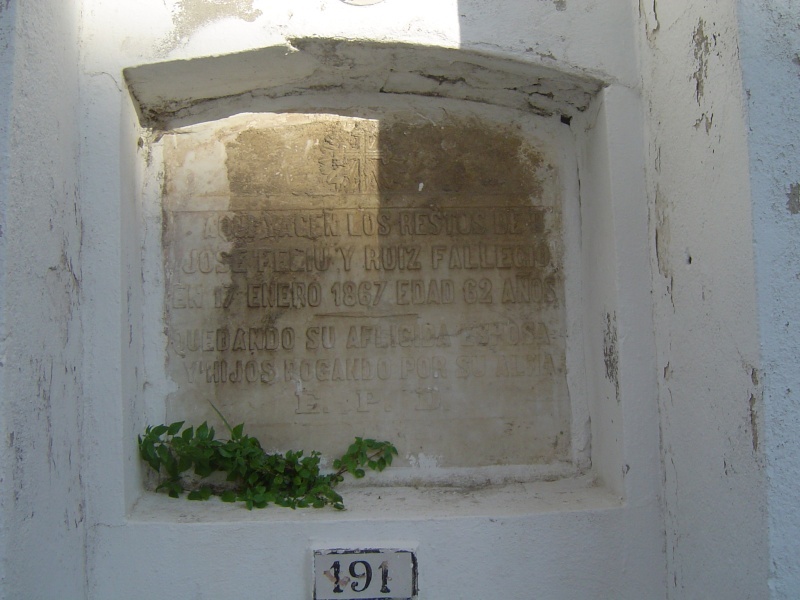 If i am not mistaken it is in spanish..
"Aquí yacen los restos de J. F. y R. fallecido en 17 de enero 1867, edad 62 años. Quedando su afligida esposa y hijos rogando por su alma"
" Here the rests of J. F. and R. deceased in January 17, 1867, age 62 years. Remaining his upset wife and children requesting for his soul ". Thanks dave not too different from our spanish ....thanks for the translation !!!!! David I still don't understand why the rules in Spain are so strict about photographing graves. In most countries you can take freely pictures and post them on the internet. In the Netherlands we have a site where people can contribute those pictures (sort of findagrave) and info from cemeteries all over country. If you do research genealogy it's very handy and , if in their database, you can request a copy of the grave's photo. Did it several times. Legally to take photos of graves is not prohibited, but it can bother to some persons and it is a necessary prudent being since in countries as Spain (Europe) there is a big respect towards the deceased and to take a photo it can be interpreted as an insult. it is a better discreet being. Today it has been buried Josep (94 years old ), who sold to me my old mare of work and taught me many things of the agricultural work: I have taken several photos of his corpse, of the funeral and of the burial. I have cried for him as if he had been my father. He had asked the family for permission to take photos of the corpse: the children have given me permission but some grandchildren were annoying. Finally the grandchildren have seen that the photos that I have taken of Josep, his funeral and his burial, were tests of the appreciation that it had for and have asked me for copies of the photos. If someone is a believer, I request a prayer for his soul. Hola, David! I love to read your posts because I am enchanted by the way you write. Some people may find it hard to understand because sometimes the words are not perfect, but I really like the way it sounds. I speak and read un poquito de espanol Castilliano from high school but I have not used it in over 30 years because in Tennessee, no usan mas espanol. I watch for your posts and I enjoy your comments about photos and customs in your country. Nuria has told me things are hard in Spain now. I hope it is not so hard for everyone. Me gusto mucho a conocerle! Adios!. I'm sorry, KittyGrandma, I got caught up in reading David's letter, and forgot whose area I posted on. There are certain dialects and ways of speaking that just give me Goose pimples to read or hear, Like Scottish brogue and the way that David's word sound on paper. I've have the pleasure of speaking to you too, and hope to do so again.